Redbook Magazine and NBC are teaming up to send one fan and a guest on a trip to the The Voice Season 14 Finale in Los Angeles in May 2018. 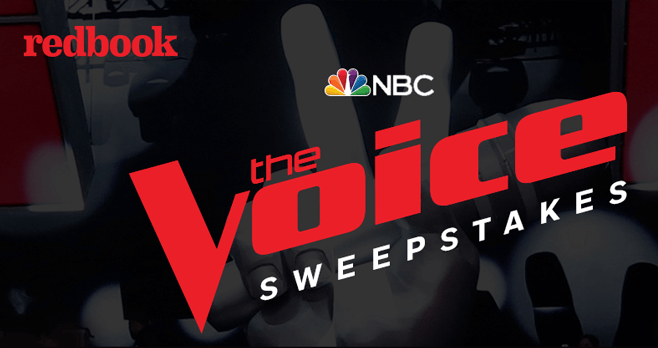 Enter Redbook’s The Voice Season 14 Finale Sweepstakes by registering online at thevoicesweeps.redbookmag.com and you could win tickets to attend both finale shows of The Voice in L.A., a meet and greet with Kelly Clarkson, plus $1,500 for transportation costs. To enter this Redbook Magazine Sweepstakes, go to thevoicesweeps.redbookmag.com on a computer or wireless device and submit the entry form pursuant to the onscreen instructions. Limit one entry per email address per day. Who Can Enter? Open to legal residents of the 48 contiguous states and the District of Columbia, who have reached 18 years of age in his or her state or territory of residence at time of entry. Void in Puerto Rico, Alaska, Hawaii and where prohibited by law. When To Enter? Beginning November 14, 2017, at 12:01 AM (ET) through January 1, 2018, at 11:59 PM (ET). What Are The Sweepstakes Prizes? The Grand Prize consists of a trip for two to Los Angeles, California to attend The Voice Season 14 Finale taking place over two nights. Who Are The Winners? For the name of the Winner, send a separate self-addressed, stamped envelope to Redbook, Floor 11, Redbook’s “The Voice” Season 14 Finale Sweepstakes Winners’ List, Hearst Communications, Inc., 300 West 57th Street NY, NY 10019 within 2 months.